Here at The Pi, we’ve shown you how to do a ton of cool software projects. We showed you how to set up a Raspberry Pi Plex server, how to watch Netflix on the Raspberry Pi, and so much more. But, until now, we haven’t done much with add-on hardware. Let’s change that. 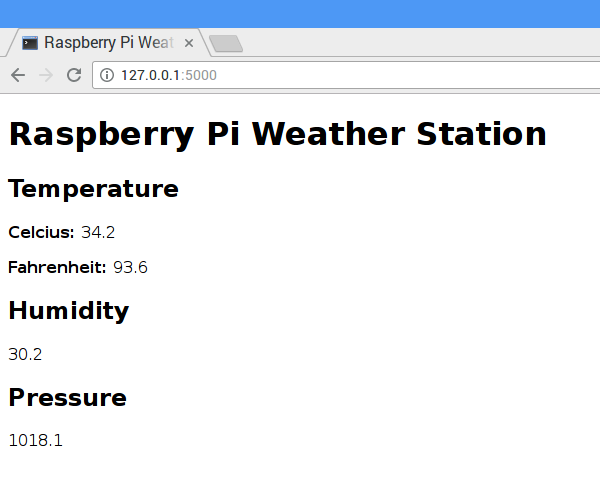 Today, we are going to do something more hardware-oriented: we are going to show you how to set up a Raspberry Pi weather station that can be accessed over the internet. 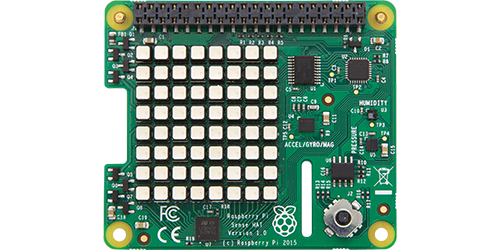 For this, we need the Sense HAT, a Raspberry Pi add-on board that was made especially for the Astro Pi mission. The Astro Pi mission sent two Raspberry Pis (each equipped with a Sense HAT and a few other improvements) to the International Space Station, where they joined British astronaut Tim Peake and helped record information about environmental conditions up there in the space ship. We won’t be launching our Raspberry Pis into space for this project (sadly), but we can take advantage of the Sense HAT’s capabilities to do some cool stuff here on Earth. To record all that environmental information, the Sense HAT was designed with a number of sensors that can detect things like temperature. You probably have a thermometer at home, so you don’t need a Sense HAT to know the temperature when you’re there. But with the Raspberry Pi and the Sense HAT working together, we can put this information online – giving your home a new smart feature. We already discussed the Sense HAT, and you probably figured out that you’ll need a Raspberry Pi (and the typical peripherals). All we need besides these things is a simple web server, so that our Raspberry Pi weather station can be accessed over the internet. We are going to use Flask, a Python microframework that can be used to build web servers and create web applications. Let’s get started. Actually, the packages we need should be installed by default – but it doesn’t hurt to run these commands and make sure. python3-flask is already the newest version. sense-hat is already the newest version. If so, great – it means we’re good to go. In this step, we’re building a Python-powered web app and a Python-powered web server using Flask. This may sound a bit arduous, but it’s actually very easy. Hit Ctrl+X to exit the file, hit Y to agree to save it, and hit Enter to keep the same filename that you just gave it. Now, we need to create a simple HTML template for the Python file we created. Let’s create a folder and then a new .html file. You can tweak yours to give it a different look, of course. If you’re happy with just temperature, we’re all set here. But the Sense HAT can give you more information, including humidity and air pressure. Let’s modify our weather station to display them as well. First, we need to exit our app, though, by pressing Ctrl+C. This is our Python file from Step 3, of course. Again, feel free to tweak the look of your personal site. Alright, the weather station is working, but it’s only available from within the home network. For example, if your smart phone is connected to the same network than your Raspberry Pi, you can browse to the Raspberry Pi’s IP address followed by :5000 (for example, http://192.168.0.101:5000) and see the same page (you can obtain your Pi’s IP address by typing hostname –I in Terminal). Yours may be presented in a different format or a different order, but you’ll want the same values in each spot. Now that you’ve done this, hop on a device that’s outside your network and enter your network’s public IP address (you can obtain your public IP address by Googling “what’s my IP address”). You should be redirected to your weather station site. Congratulations – you’ve set up a Raspberry Pi weather station using the Sense HAT! 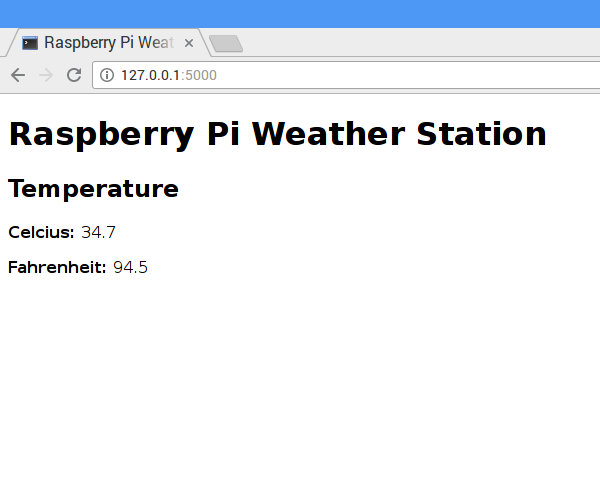 5 Comments on "How to set up a Raspberry Pi weather station using the Sense HAT"
Question: Won’t the reported temperature be more influenced by the heat radiated from the Pi that by the ambient temperature in the home? Very nice project. I like it. Since I would have to pay extra money to my internet provider to host a web server, it would be nice to have instructions on how to upload the data periodically to Dropbox, Google Drive or similar instead. Uploading data to Weather Underground is another option. thanks for the quick write up. It’s very useful for a beginner like myself. There is a minor typo in the statement below. Fahrenheit should be lower case.